Recently New York’s City Council approved plans for a new skyscraper to be built across the street from Madison Square Garden and Penn Station. This being prime Midtown Manhattan turf, the plot at 15 Penn Plaza is, of course, already occupied. And not by just any old high rise. The Hotel Pennsylvania resides in a columned McKim, Mead & White structure built to complement the original columned Pennsylvania Station that was torn down in 1963, a loss preservationists mourn to this day. As I hadn’t visited the all-but-doomed Hotel Pennsylvania in a while, I decided to stop by and see what may soon be gone forever. On paper, the Pennsylvania’s historic bona fides rival those of fellow grand dames like the Plaza and the Waldorf=Astoria. Consider the almost biblical evolution of its name. Built in 1919 by its namesake Pennsylvania Railroad, this was the classic grand-but-functional hotel next to a train station. In 1948, Statler Hotels purchased the hotel after managing it for years, changing the name to Hotel Statler. It became the Statler Hilton in 1953 when Conrad Hilton took over Statler’s portfolio and morphed into the New York Statler before boomeranging back to the Hotel Pennsylvania in 1992. Among the predictably illustrious guests who passed through its decorous portals were William Faulkner, Charles Chaplin, Herbert Hoover and Robert F. Kennedy. And as fans of the old movie The Glenn Miller Story know, a novelty song from the 1940s was inspired by the hotel’s phone number PEnnsylvania 6-5000. You still see hints of the hotel’s storied past in its classy exterior, fronted by those timeless columns and a fleet of American flags. But hopes for a brush with past glories dimmed as I watched a guest wrestle his duffle bag from the grip of the hotel’s narrow revolving door. Once inside the hanger of a lobby, I couldn’t decide if the place reminded me of a Soviet-era Moscow hotel or an airport at rush hour. The hotel boasts a jaw-dropping 1,700 rooms. From what I could tell, half the occupants were congregated in the lobby the precisely moment I entered. The line to check in snaked back and forth like the day-before-income-tax line at the post office. And though ample seating is provided, nearly every spot was taken on a suite of brown leather sofas. I edged past a sleeping woman, her head nestled in her husband’s lap, her legs stretched the length of the couch, and scored a spot next to a man who unwrapped an enormous hoagie from Charley’s, sniffed it, then gobbled it up in seconds. Vintage photos of the original lobby, available on the hotel’s Facebook page, show a stately sprawl, lined with Doric columns and potted palms, crowned by a decorative glass ceiling and ringed by a mezzanine overlooking the main floor. Today’s Pennsylvania, in contrast, exudes the bulky modernism of a building that underwent a major makeover sometime mid-century followed by occasional touch ups, none recently. Mirrored red-marble columns support a low white ceiling lighted by flood lights instead of chandeliers. The mezzanine is long gone. Storefronts border the back of the lobby. Those still in business sell electronics and cheesy souvenirs, like Statue of Liberty crowns and Barack Obama decorative plates. If you’re seeking a spiritual cousin to the subterranean Penn Station across the street, look no further. Though soulless, the lobby isn’t scary. But the two floors of ballrooms and meeting rooms reached by a side elevator are. The ancient elevator creaked and shimmied as I ascended to the second floor, where a casting call for a revival of The Newlywed Game TV show was being held. The third floor, a vast expanse of dimly lighted hallways and closed doors, was silent and utterly deserted. I didn’t get to see a guest room, so I checked out write-ups on user review sites like Raveable, Trip Advisor and Yelp. The overall verdict amounted to Okay if you don’t want to pay much, leave small children at home and have extremely low expectations. It was time for lunch. After passing on in-house outposts of Lindy’s and Philly Cheesesteaks, I stumbled onto the Statler Grill and smiled. With white tablecloths, tufted banquettes, a manly wood bar and a wait staff recruited from steak houses around town, the restaurant is just what the historic but neglected Hotel Pennsylvania needs. Happily tucking into my shrimp filled “Dr. Olson’s chopped salad” – splendid vinaigrette dressing but a bit pricey at $22 – I asked the server who Dr. Olson was. Answer: the army biochemist who leapt from a hotel window in 1953 after being fed LSD by the CIA. “My boss has a sense of humor,” the waiter remarked. So what should be the Hotel Pennsylvania’s fate? The newly formed Save the Hotel Pennsylvania Foundation wants the site declared a landmark and rehabilitated to its early 20th-century splendor. They’ve got a point. The hotel was once a looker, and there’s a precedent for reviving pedigreed grand dame properties. 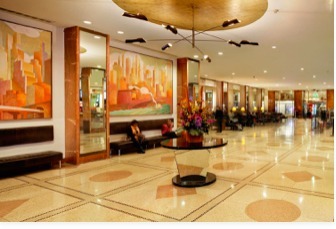 The millions poured into the Waldorf=Astoria in the 1980s brought back its Art Deco glory and was money well spent. But sometimes a place is just too far gone. Vornado Realty, the Pennsylvania’s current owner, has never shown this one-time beauty much love, and now they have the go-ahead to build a statement skyscraper that will stand head to head with the Empire State Building. It’s hard to be optimistic about the Hotel Pennsylvania’s future. Is the Hotel Carter the Dirtiest Hotel in New York?